Can Jesus Christ return at any moment to rapture the church? Can Jesus Christ Really Return at Any Moment to Rapture the Church? According to those who believe in a pretribulation rapture, Jesus Christ can return at any moment to rapture the church. Those who believe that Jesus Christ returns in the air to gather his church before a seven year period of tribulation, hold to the doctrines of dispensational theology. Cyrus Ingerson Scofield is the author of the commentary that appears in the Scofield version of the English Bible. He defines a dispensation as “a period of time during which man is tested in respect of obedience to some specific revelation of the will of God.” Dispensationalism is essentially the belief or teaching that God has worked with mankind according to different methods in different time periods. John Nelson Darby, who separated from the Church of Ireland and became the leader of the Plymouth Brethren during the mid-1800's, is credited as the founder of modern dispensationalist theology. Darby taught of a literal, one thousand year reign of Christ on the earth. Darby's teachings were able to greatly influence Americans and American religious leaders because his dispensational theology emphasized this literal, pre-millennial return of Christ that was already familiar to Americans and had already been accepted by many of them. Darby's teachings also emphasized the rapture of the church, or the "secret rapture," as may have been taught to believe. The concept of a “secret rapture” has been popularized through the “Left Behind” fictional books and movie series. The doctrine of a pre-millennial, pre-tribulational rapture of the church can be understood as an event to take place at the second coming of Christ when the members of the body of Christ, both living and dead, would be caught away to dwell with Christ in heaven before the time of the Great Tribulation and before a literal, one thousand year reign of Christ on earth. Darby also believed that this rapture could occur at any moment. This doctrine was unlike any of the previous millennial teachings, for those who held to a millenarian doctrine may have expected Christ to come to the earth eventually but not at any moment since they believed various prophecies had to come to pass prior to the Lord's return to the earth. Darby's teaching that a secret and silent Rapture could take place at any moment is highly problematic. First of all, there are inherent contradictions in the dispensational theological concept an “any moment” return of Christ. The majority of fundamentalist dispensationalists adhere to the concept of seven distinct dispensations. These seven dispensations consist of: innocence (creation to fall), conscience (fall to flood), human government (flood to the call of Abraham), promise (call of Abraham to Mount Sinai), law (Mount Sinai to Pentecost), grace (Pentecost to Christ's Second Advent) and kingdom (Second Advent to Great White Throne judgment). Dispensationalists believe that the dispensation of grace (the church age), is approximately 2,000 years long. Those who claim that the Messiah could return for his church at any time also teach that the age of grace when the church is being formed takes two millennia. How can Christ return at any moment to rapture the church and yet the church is not completed and ready for the rapture until the age of grace is over? To believe in a pretribulation rapture means to believe that the elect are gathered just prior to the seven year time of tribulation. How can you claim that there are no prophecies to be fulfilled concerning the return of Christ and discount the many prophecies that are and will be fulfilled concerning the time of the tribulation? If Jesus returns just prior to the time that the prophecies concerning the tribulation are being fulfilled, then the teaching that Jesus can return at any moment is a contradictory statement. The concept of an “any moment” return of Christ is popular but false. Jesus will not return until the end of the church age when the prophecies concerning the time of great distress are fulfilled. Secondly, there are inherent contradictions in the dispensational theological concept a secret and silent return of Christ. In such a view, the elect in Christ only hear the loud command and call of God. A secret rapture is contrary to the clear teaching of Scripture that states that every eye will see Jesus at His appearing in the air (Revelation1:7). Is it not logical that the rapture will be an event of biblical proportions emphasized by a worldwide demonstration of the power and glory of the Lord? The rapture will be heralded by the glorious presence of Christ, a thunderous shout, the booming voice of the archangel, and trumpet blasts heard around the globe. There will be such a cacophony of sound and such an authoritative command from the Lord that the dead in Christ shall be raised to life! The great shofar blast (sounding of the last trumpet), signifies the call of God's people into his presence (the Rapture), the heralding of the soon-coming King and the call to battle (Armageddon). These events are not seven years apart nor are they secret or silent. 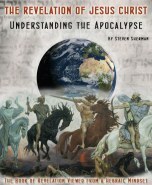 Steven L. Sherman, author of THE LAST DAYS CALENDAR: Understanding God's Appointed Times is a “watchman on the wall” who is willing to stand against the tide. He believes that we now live in the day that men no longer put up with sound doctrine. “Instead, to suit their own desires, they have gathered around them a great number of teachers to say what their itching ears want to hear.” Although there may be many who reject the message, Steven Sherman must sound the trumpet and announce that the coming tribulation is ordained by God as a refining fire for His people. The Book of Revelation is a letter to all Christians. It is a call for patient endurance and exhorts the believer to stand firm until the end. Those who have placed their faith in the Messiah can take heart because Jesus has assured his followers of final victory. In order to better understand the Book of Revelation, as well as all the prophetic verses of Scripture, it is necessary to interpret these passages within the context of historic Judaism and with the knowledge of The Festivals of the LORD. God's “Appointed Times” for Israel are not just historic ceremonies, but prophetic declarations which encompass both the First Advent and the Second Coming of Christ. THE LAST DAYS CALENDAR: Understanding God's Appointed Times is a “must” read.